Nemzetközi Érdemrenddel tüntették ki kábítószer-ellenes munkájáért H.G. Prof. Popper Györgyöt, a budapesti központú Nemzetközi Testőr és Biztonsági Szolgálatok Szövetségének (IBSSA) elnökét. A komoly presztízst képviselő kitüntetést első alkalommal ítélték oda európai szakembernek, a díjat a Kábítószerellenes Tisztek Nemzetközi Szövetségének (INEOA) 49. kongresszusán 2008. augusztus 4 -én Orlandóban (USA Florida) Stephen F. Minger az INEOA elnöke adta át. Budapesten tavaly megalapított Európai Drogelhárítási és Drogmegelőzési Központ irányítja. A díj elismeri a magyar szakember tevékeny drogellenes részvételét a különböző nemzetközi szervezetek munkájában. A többi között tárgyaló delegátusa az Európa Tanáccsal párbeszédet folytató Mission Europe - nak, és ő vezette például az IFNGO (Nem Kormányzati Szervezetek Nemzetközi Szövetségének) delegációját idén tavasszal az ENSZ kábítószerellenes szakmai tanácskozásának bécsi ülésén is. 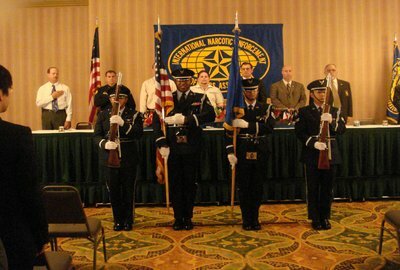 The Magisterial House proudly announces that, during the 49th Annual International Drug Enforcement Training Conference of INEOA (International Narcotic Enforcement Officers Association), which was held from the 3rd rd to the 8th of August 2008 in Orlando, Florida (USA), His Grace Count Prof. George POPPER, Lieutenant General and Prime Minister of the "Sovereign Order of Saint John of Jerusalem - Knights of Malta - Federation of the Autonomous Priories" as President of IBSSA, was awarded with the "International Award of Honour" due to his anti- -drug activities and outstanding specific achievements, which involved cooperative efforts between agencies of different nations. 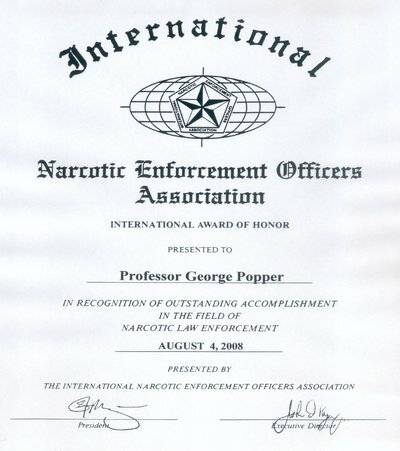 Count Sir George Popper was one of the rare Europeans, and the first from the eastern Europe, to receive this prestigious award, handed over to him by Mr. Stephen F. MINGER, President of INEOA. The appearance in Europe of synthetic drugs and the easy border crossing are significant facts that justify the need for a "crescendo" of INEOA in this continent. Thanks to the active work of H.G. Sir George Popper, law enforcement officers from more and more countries of the European continent are joining INEOA, the association which provides information and organises training events. In Eastern Europe but also on the Western side the coordination of activities of all civil organisations, dealing with drug consumption and drug prevention, the education, as well as the advanced training of the participants, has just begun and this work is coordinated by the European Narcotic Enforcement and Drug Prevention Centre (EDDKE), which was set up last year in Budapest, Hungary, upon urge of the Sir George Popper as IBSSA President. 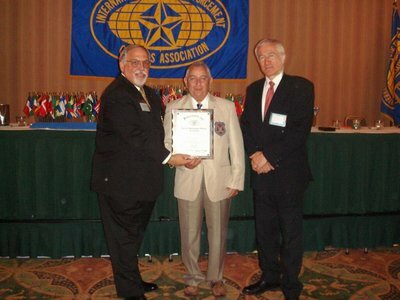 This international award recognises the active participation of H.G. Sir George in different international organizations. Among others, he is a negotiator delegate of "Mission Europa", which has participation rights in the European Council and last April he led the delegation of IFNGO (International Federation of Non Governmental Organisations) to the 17th Session of the U.N. Commission on Crime Prevention and Criminal Justice in Vienna, Austria.